We’ve looked at the S&P 500 index market breadth which is very strong and leading the market higher. Now let’s turn to another early warning system that is providing a slightly different picture of market internals right now. While the S&P 500 index has been hovering around its high for the year, the number of new 52 week highs has dropped off dramatically. When new 52 week highs peak and are unable to reach a new high, we have our very first signal for the end of a cyclical bull market. It is a bit too early to definitively say that is the case right now but this divergence between the market and the new 52 week highs is noteworthy nonetheless. Usually when new highs do crest, we have on average an early warning system that provides about 34 weeks advance notice that the equity market indexes will follow suit. Of course, sometimes it is much less and sometimes the market trundles along much longer than most would expect. As I’ve already mentioned more than a few times, the breadth data from the NYSE is suspect because of the number of non-operating company securities that trade on the Big Board. These include ETFs, municipal bonds, actual bonds, etc. that have really nothing to do with what we would normally associate with equity securities. And because they are for the most part interest rate sensitive, they can, at times, significantly skew the breadth statistics. The fact that we are seeing a very similar picture in both indexes confirms that there is a divergence between the number of stocks making new highs and the market proxy (S&P 500 index). The key question is how long will this last? We saw a total collapse of new 52 weeks highs at the February lows. But then, along with the market, this indicator tracked higher and actually reached a new high in mid-March. If we see this indicator return sharply higher, or even reach a new high, then the health of the cyclical bull market is intact. As well, notice that the last time that we saw a similar divergence was during at the January highs. The S&P 500 was hovering between 1140 and 1150 but suddenly the number of new 52 week highs in both the NASDAQ and the NYSE fell dramatically. Not long after, the S&P 500 index followed suit. As you can see, similar to the number of new 52 week highs, it usually tracks the market under normal circumstances: falling and rising with the S&P 500. But for the past few weeks, even as the market has been consistently rising, there has been a rather surprising lack of new highs vs. new lows. Perhaps I’m too jumpy but I consider this an early early warning signal. Very interesting Babak. Unfortunately there are no high - low stats on the Russell that I can find for small cap (non) confirmation. Clarence, maybe there is but I haven’t found it. The only other new highs/new lows data is for the AMEX market. But I don’t think that’s really helpful. Thanks for the charts. A very interesting way to look at the market. The new high/low ratio looks quite interesting, and I think it is more informative. As we can see, in Oct, 09 and Feb, 10, the peak and then decline of the ratio is confirmed by decline of S&P. However, current (Mar, 10) decline in the ratio is not confirmed. And the ratio is not as extreme as in Feb. 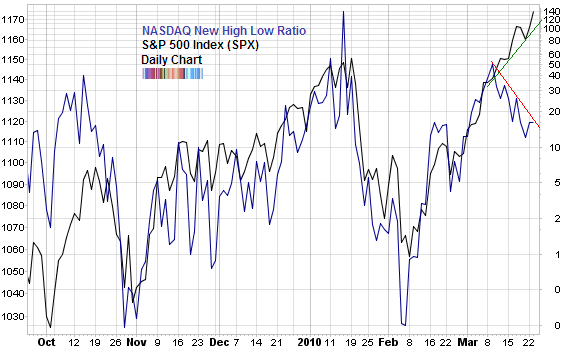 I see the deivergence between new H/L ratio and S&P may fulfill some analysts’ prophecy - a stock picker’s market; or a consolidation for next leg up. Once again, thanks for these charts. Feels good to learn something new everyday! Would you share the source of the information. Streetcar, the new high/new low is a very good indicator but I just noticed that I had used the arithmetic scaling for the chart. I’m going to change it to logarithmic so that it will be more clear. Glad you found it interesting, you’re welcome. There have been a lot of these signals coming up. Check the EMA(10) of $NYHLR, $NYAD, and even closing $TICK and you’ll see divergences. Also, $CPCE is trending back up. Problem is, with this latest 6-week run, whenever we call the next top, we get proven wrong again and again! I thought Monday was supposed to be the first day in this downtrend - all of a sudden my newspaper was back to carrying negative news about the Greek situation and bad US debts. Seems that the people running the market are suffering from a lack of communication! thunderbird, you’re right in that this up trend has been built on the bones of market top callers. As I said above, this is an early, early warning system. Anytime you have a 70% move in either direction, the market is going to violate a lot of traditional divergence indicators during the process. A lot of indicators are bound by x and y, while the market is unbounded leading to an inequitable comparison. Charts can be so misleading, because when the market finally sets a top, you will be able to see so many indicators near 1 or near the top of their range, because that is where that indicator goes when the market moves higher. But if you dig back through the charts you will find many other visits to those same levels during the journey. If your putcall ratio of choice (or whatever indicator) ranges from 0.8 to 1.2, it’s probably going to be at 1.2 when the final top is set, albeit, the nth time it has been there during the intermediate cycle. It was pointed out by readers here, six months ago that the % of stocks making new highs as a function of the % of stocks making either news highs or lows was 99.5 and since the indicator couldn’t get any higher, the market had to go down. But just because the indicator can’t go higher, doesn’t mean that the market can’t. The same arguments worked in reverse during 2008 down move. On a different subj, one of the strange things about market analysis is how much we seem to be constrained by the tools that we had at our disposal 50 years ago that have become ingrained in our trading psychy. For example, we (myself included) use the NYSE advance decline line to tell us whether the broad market is participating. Would it not be more logical to simply look at the price of the Wilshire 5000 index which was at new highs back on March 9th for confirmation that the troops are in step with the generals and in this case actually leading. If you know a kid graduating from High School this spring, do them a favor and throw in a copy of Jimmy Rogers, “A Gift to My Children: A Father’s Lessons For Life And Investing” with your graduation card. He stresses to his children how important it is to learn to think for themselves, use common sense, outwork their competition and not follow the crowd. Good old fashion advice, that it doesn’t hurt the parents to review as well. I’m a complete amateur, so take this fwiw. 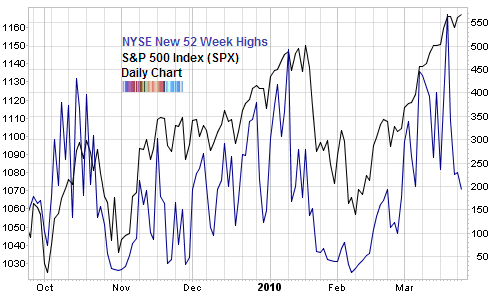 I plotted NYSE 52wk high against Wilshire (broad index) along with MAs for NYSE 52wk highs some oscillators. Now, what would I deduce from this? 1. 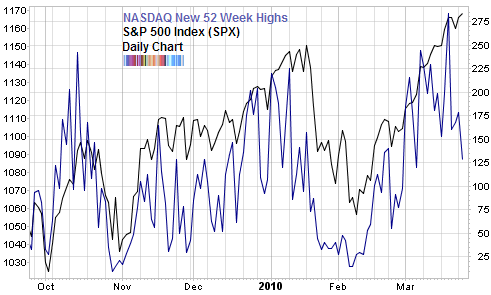 52wk highs/lows have been an indicators of short-term trends (turns) in the overall market (bear or bull). They don’t indicate the overall turn of the market. 2. When 52wk highs start bottoming out @ zero, we COULD (not necessary are) near a major bottom. Makes sense, obviously. 3. NYSE 52wk high 50vs120d MAs divergence from each other is a signal of potential support levels, breakdowns in interim trend AND potential upside/downside move magnitude (see 6-12/08 & 6-12/09). 4. Use oscillators for confirmation. NYMO is shorter term and says we could be heading down in the short term, but looks indecisive today. NYSI appears to confirm still the current interim bull trend for now, although it may be in the process of turning over (1 month timeframe). All in all I say the market still has upside potential, but volatility is likely to increase. Hello, I am very impressed by your blogging competencies. I am a blogger myself. IBD for market technicals. One thing I noticed from at least a short term perspective is in particular your chart on the 52 week new high list on NASDAQ versus the s&p 500. If you notice the blue line tends to proceed the ensuing decline in the market . First off it makes higher lows and higher highs but when this trend changes and it makes a lower low than the preceding low that is your warning to get out the next few days or to put on a short trade as you get one last push up before it collapses back down and then the market follows suit. I hope this makes sense. It looks like we are going to see one more attempt by the market to go up to the old highs maybe on Monday of next week and then we should see a 5 to 10 percent correction if I am right.